Are you looking for LEGO Harry Potter (USA Version)? 1.Once you have wood r4 and the game on your micro SD load up wood r4. 2.Highlight the game (Don't load yet)and press start. 3.Then press file info and then Y. 6.And then just play the game! Note: If you have a R4 and Wood R4 and the game doesn't work, even if you disable the soft reset, then it means you have a fake card!!!! 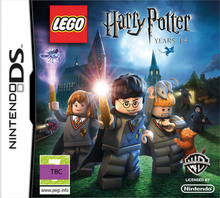 Note: Copy any of the above LEGO Harry Potter: Years 1-4 (Europe) rom download links and paste it into your browser to download. Doesn't work on Wood R4 1.09 with .NDS extension. where to use this button combination ? ...but the lousy controls (too much use of the stylus on touchpad) make it the poorest Lego game I have played. Maybe it will be better on PSP or other versions? I can confirm it does work on R4Wood. You need to disable "soft reset" within the options for the game before loading Lego Harry Potter. I am trying to get this game to work for my grandson, and know next to nothing about downloading and installing NDS games. He has an R4 card, bought a couple of years ago. Is it compatible with the new Lego Harry Potter game? The screen is black when he tries to open the game. Could someone kindly explain what I have to do (simple explanations please;-)) to install and get the game up and running? How do you disable 'soft reset'? How do you get into the options of the game before loading it? you highlight the game and press start and then file info, press the arrow next to the top bar to get onto the reset option. 1 problem once on the game it say it can't read the saved file?? help plz! "I can confirm it does work on R4Wood. You need to disable "soft reset" within the options for the game before loading Lego Harry Potter." I have just installed R4Wood. How do I disable 'soft reset'; I can't even see the options folder. Could you give me step-by-step instructions? Thanks a lot. Thanks for the instructions,. Just out of curiousity, what do you have in your wood r4 folder? I have only icons, cheats, languages, fonts and ui; can't quite see how these are going to allow the game to play. Should I remove the system and/or moonshl folders? nonono there all you need. do you want me to give you a link to a really good tutorial. no wait are yo using the wood r4 that opens as soon as you turn on your card?? i have ah problem when i press start it takes me back to my start menu ?? I am unable to get this to work on my M3 DS Real. Hey when on wood with reset off it says it is unable to acess save data. Any thoughts on that? Thanks SiHH!!! You made my son very happy!!!!! is it working for ds lite or just for the newest ds version only? I installed Wood R4 and disabled "soft reset" as Anonymous June 27, 2010 9:26 AM said. Now the game is working (thanks! ), but I can't jump or hit objects. Does this patch work on my ttds? The Game is not bad, btw. If I instal the R4 wood, will I lose all my current games on my card? Always keep a backup of your games. .it does not work for no$gba.help me please. is not working in my r4ds v 1.18 english anyone have a patch for that? Any news for at Fix for DSTT ? I put the R4 1.18 kernel in then put WOOD over the top and started the game, nothing fancy just started the game. Funny how every thing always works with "my" Cyclods, you get what you pay for I guess. Does not work for acekard 2i v4.21 FW black screen already tried disabling soft reset and nothing any ideas? I have super card ds one and would like help to get it to work for my daughter. Don't bother downloading this, if you have a DSTT card - unfortunately, it needs a patch to work !! I have supercard ds one, doesn't work ... help me please !! This game sounds dodgy with all of the hassle. Can it work on an R4i? The last anonymous says so. By the way, what's a patch? p.s. I don't know if it works on other firmware then wood but i hope so. Pim.. the game needs a fix/patch in order to work on DSTT cards. We all know it works on R4 cards - but that doesn't help the DSTT card owners.. Normally patches/fixes are created rapidly - this one must be very hard to fix/patch. The game came out on June 22nd. is it in any R4 card it works? Is it possible to update a R4i (for DSI XL)with "wood 1.10" or it is only for R4 ? does it work on r4i ultra and m3 ds real? If you have a R4 and Wood R4 and the game doesn't work, even if you diseable the soft reset, then it means you have a fake card!!!! Oh well, let's play Tales of Innocence, that works perfectly! The AceKard thing doesn't work for me.